The photography shows the garden between the two farms Rellichhof and Tschifleinhof in Termeno where you can enjoy farm holidays in a fantastic landscape. You may not use HTML? Here is the complete HTML code with which you can insert a link to this 360 photo on your website. Paste the code in the source code of your website. If you wish, you can embedding the photo directly into your website by an iframe. 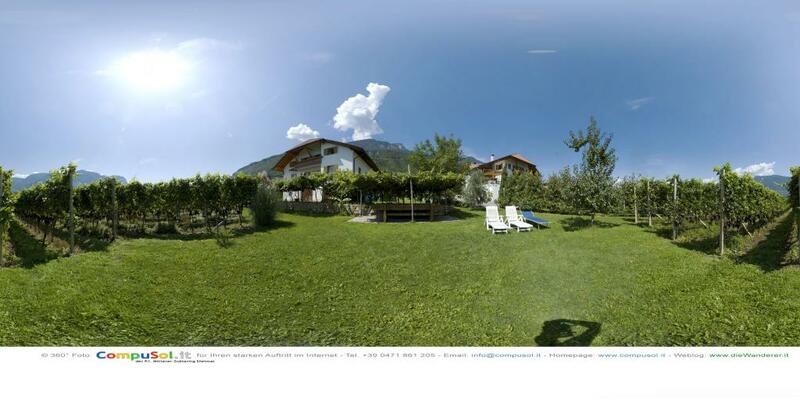 If you insert the link to this 360° image in your site, then you can copy and paste this image into your website. The image is displayed here at 300 pixels wide, but is actually 1024 pixels wide. If you wish, you may cut away the white bar with the credits. The link is sufficient for the author identification.